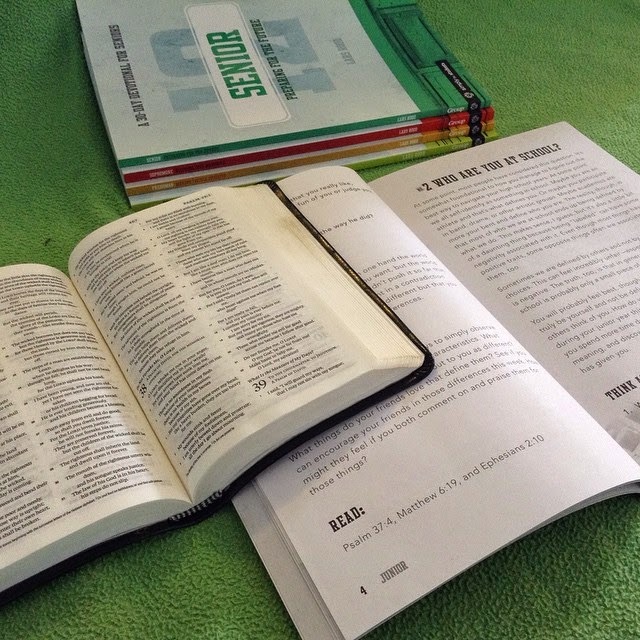 The past couple of weeks, I've had the amazing opportunity to be reviewing a series of fantastic devotionals for teens, courtesy of Family Christian! These are billed as "a 30-day devotional" for each grade (7th through 12th), but what we are finding is that we like these much better as a school-year devotional. To do that, we are doing one "day" per week, which gives us 30 weeks of material. What is fabulous about that is that for my older boys, especially, it gives them more time to really work at the "Act" portion of the study. But I'm getting ahead of myself. 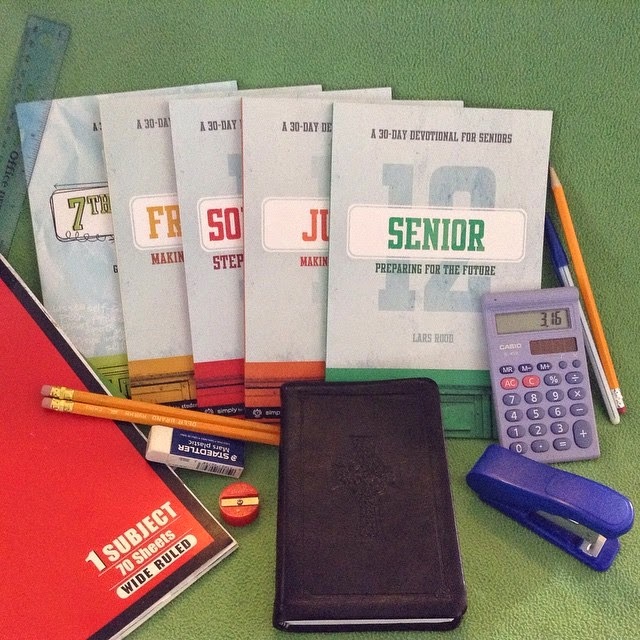 Lars Rood has written a series of devotionals based on grade levels, and I was privileged to work with almost all of those titles. These studies are set up so they are similar to each other from year to year, but the tone, content, and focus change from year to year. Thomas is working with 7th Grade: Growing Your Faith. This is split into three sections of ten lessons each. This book is talking to the kids about the process of becoming an adult, now that they are, or are about to be, teens. The first section is on owning and shaping your faith, and talks about doubts or not being able to answer questions. The second section focuses on shaping your thoughts, and I really love this part. As these new teens start having the chance to make independent decisions, it is so wonderful to do something that helps them to be a bit more aware of how those choices, how those thoughts, can impact their life. The final section has to do with shaping the "whole you" and addresses some puberty issues, along with a lot of other concepts. Each lesson includes a reading of about a page, a Think About section with some questions to answer, a God Thought section with a scripture reading suggestion, and an Activate section with an activity. The activities tend to be pretty easy to do on your own. One in the middle section has him going around and counting up all the ways he can access media in the house, which I think is a bit mind-blowing. Then he is to pray about how he uses those devices. The high school devotionals are a bit longer. You still have a reading to do, followed by a Think About section with questions to answer. Then there is a The World Thinks section, which points out what popular culture has to say about the issues being address, which is always a contrast to what the Bible has to say. Then there is the Act section (similar to Activate in the 7th grade book), and this is the section that made my kids petition to do the study over 30 weeks instead of 30 days. Many of these activities are meant to be done over multiple days or even weeks, or some just require a bit of planning. One towards the end of the Freshman book has them finding a ministry that cares for people in your town, and going with a group to help there for an afternoon. They are to be asking people why they are doing what they do. My older two were afraid that if they tried to do this at the 30 day pace, they would definitely end up skimping on the Act activities. The final section is just a Read section that includes a scripture reference (or two or three). The high school books do gradually get more mature. Freshman: Making Faith Your Priority focuses on firsts, growing your faith, and figuring out just where Jesus fits into your life. William is working in this book. Sophomore: Stepping Into Maturity is the book I looked over the most, and it has to do with maturing your faith, your focus and your decisions. Junior: Making Sense of It All is the one Connor is using. The main question in this book is really Who Am I? Senior: Preparing for the Future has to do with "lasts" as you are finishing up high school, and getting ready for the next chapter, whatever that might be. What we LOVE about these books is that each assignment can be done fairly quickly. The devotional part is pretty short and the tone is great. My kids don't feel talked down to at all. The questions make for great discussion. The Bible readings are usually fairly short. The only possibly time-consuming part is the "Act" section. Because we homeschool, some of the Act sections aren't totally applicable as written, but most of the more "school-based" activities can be adjusted fairly easily. The kids unanimously feel that the books target their grade/age very well, and they all want to continue on to the next book. I have a $50 Appreciation Certificate to give away. That would allow you to purchase all of these titles and still have money left over. I would use the $50 AC to purchase items for my upcoming mission trip to Bulgaria. The host church has mentioned that they need small group bible study materials. I'd like to put it towards a curriculum. These look great -- I'd def. purchase them, and the difference I'd use to get a new Bible; mine's falling apart. I've been looking at all the bibles on FC.com, really wanting one. That's what I'd get with some of it. Not sure about the rest. I would to purchase the lastest Joyce Meyer book. I want some of the t shirts. I have been eyeing them for a while now. I might get those devotionals. They look great! With the money, I would purchase my oldest daughter a new Bible with a leather cover. Her other is falling apart from use. A few shirts or use it towards a Bible. I'd get music CDs. We have a growing list of songs the kids want to learn, and the music they listen to feeds that list. I want them to keep listening to great music. I would get Third Days newest CD! Thanks for the oppurtunity!